I’ve never been much of a holiday person, but for some reason, I’m feeling especially festive this year. So far, I’ve published a gift guide, bought an advent calendar, drank my first glass of honest-to-goodness eggnog (thanks Organic Valley, for sending me my first carton of eggnog ever!) as well as dedicated an afternoon to making Christmas wreaths with a friend (although my wreath was beyond ugly and not even worthy of Instagramming — Tumblr and Pinterest make it look so easy, dammit). 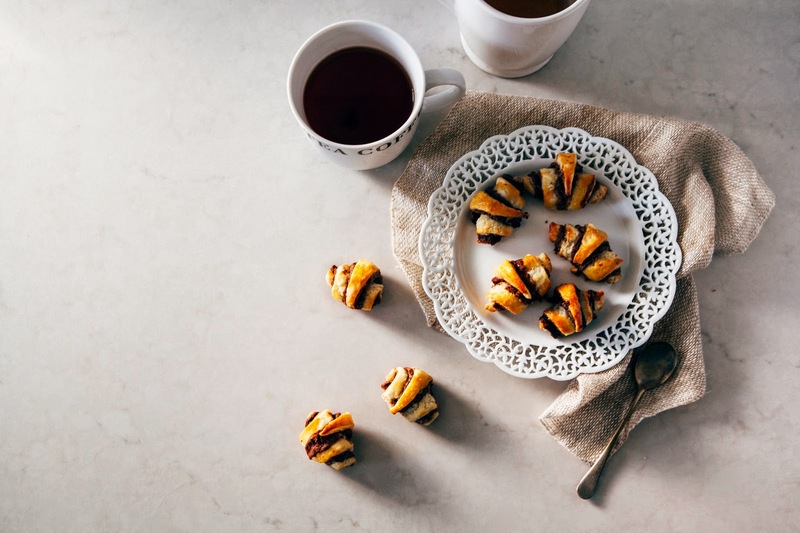 Growing up, traditional rugelach filled with jam and nuts always appeared around the family table during Yom Kippur and Purim. As a little kid, I always avoided the stuff. At the time, cookies with nothing but fruits and nuts just seemed like the most depressing thing and ruined the whole point of, you know, cookies. 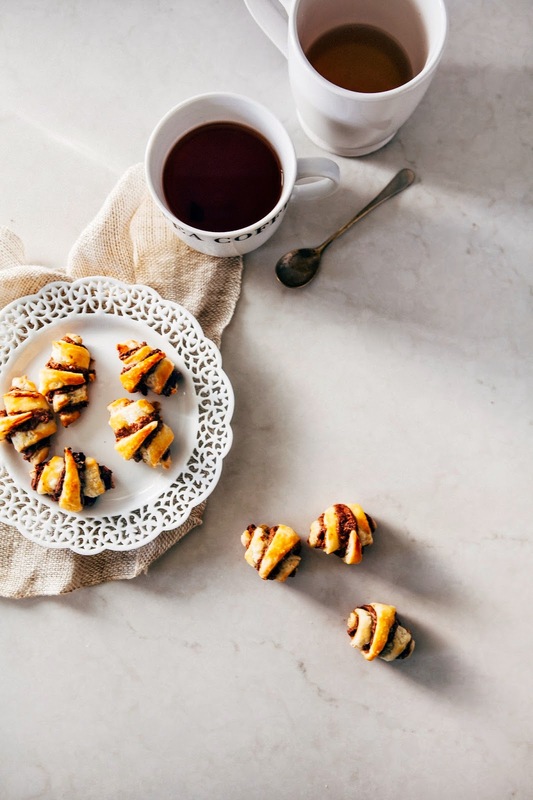 Little did I know that I was kind of missing the point of rugelach — because rugelach is basically pie crust, rolled up into little crescents resembling mini croissants. Fresh from the oven? It’s flaky, buttery and everything you want good pie crust to be. The fruit and nut filling is almost an afterthought. Almost. Because as an homage to my childhood, I decided to whip up a batch of rugelach that my young self would heartily approve of: rugelach filled to the brim with Nutella. I spent last Friday afternoon testing out different fillings — jam, peanut butter, halva (as the wonderful Molly Yeh recommends), almond butter... but the clear winner for me was Nutella. No surprises there since I've basically been having a love affair with the stuff since my youth (and yep, I just admitted to loving a sandwich spread on the internet), BUT the very competitive and way-too-close-for-comfort second place winner? Speculoos, the gingerbread cookie butter that is basically dessert crack. I stuffed a test batch of my rugelach cookies with a generous swirl of both Nutella and Speculoos and ohhh boy, those cookies were devoured within minutes. Other test batches included more solid ingredients to give my rugelach the somewhat gritty texture I remember from my childhood. Contenders included mini chocolate chips, chopped up nuts like pistachio and hazelnut and dried fruit like cherries, peaches and strawberries. 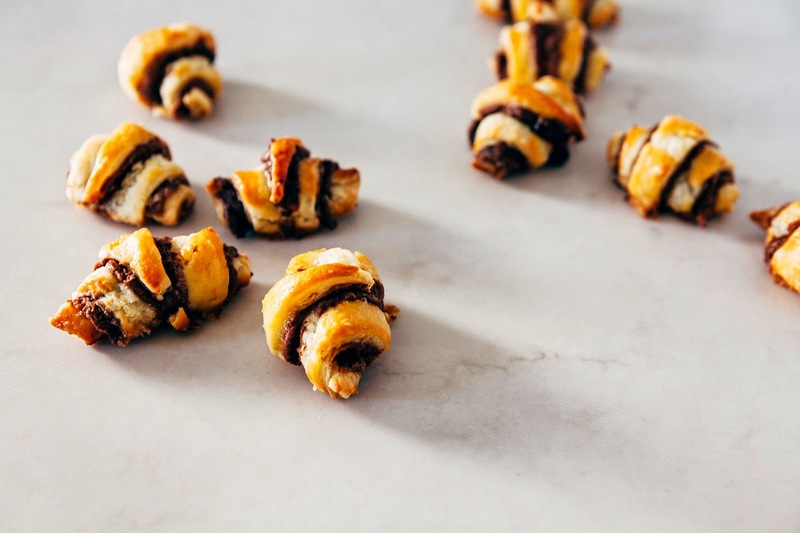 I was fully expecting my sweet tooth to proclaim chocolate chips the winner, but I found that they were too one-dimensional and didn’t add anything special to the Nutella rugelach. Instead, the dried cherries worked best, adding a wonderful chewyness to the cookie’s texture, as well as bursts of tart fruity flavor that played well with the Nutella. I’m including the recipes for both the Nutella and Speculoos / Nutella and Dried Cherry combinations, but know that the recipe is super flexible and you can swap out my fillings with your preferred fillings. Happy Hanukkah! I've written the recipe the way I made the rugelach — using a food processor to cut butter and cream cheese into the dough. The trick is to just pulse the ingredients for a few seconds at a time until they come together; do not overmix the dough or you'll be in danger of tough cookies! I realize that not everybody has a food processor though, so note that you can also make the rugelach by hand by cutting the cream cheese and butter into the flour using a pastry blender or two knives. Stop when the dough forms large curds. 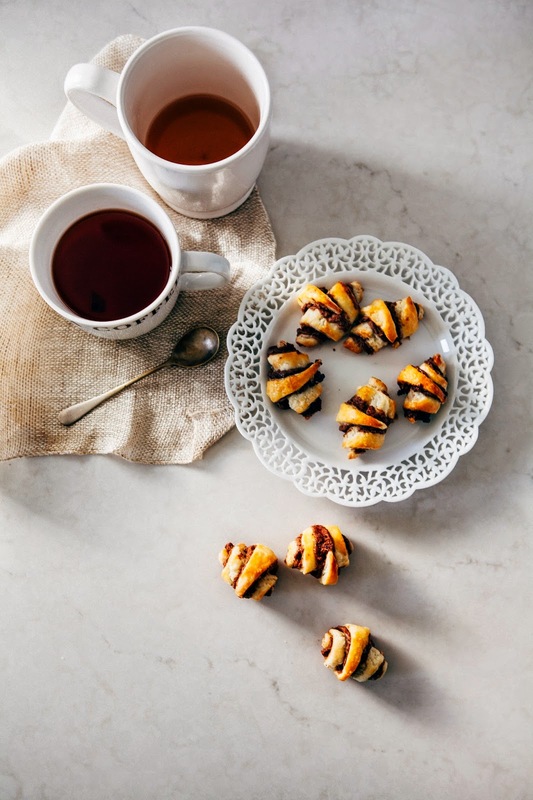 Rugelach usually comes in two shapes — pinwheels (where the dough is rolled around the filling and then sliced into individually cookies) and crescents, like you see here. Crescents tend to be more labor intensive, but they're the shape I remember from my childhood and so I'm biased and think they have a better texture. 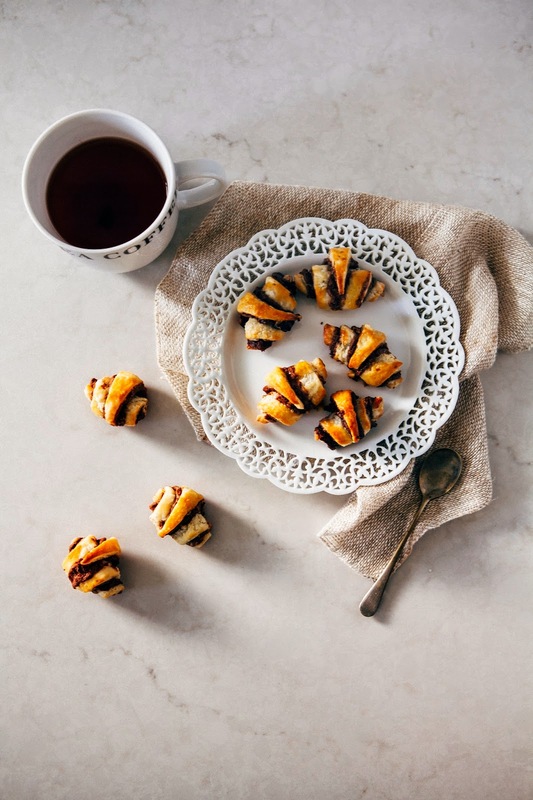 To get the crescent shape, you roll the rugelach dough into a circle and then proceed to slice them into wedges. This process is greatly helped by a pizza slicer (if you're looking for a good pizza slicer, I recommend this beauty by Savora), but you can also use a sharp, serrated knife or a bench scraper. In the bowl of a food processor with the blade in, combine 1 cup all-purpose flour and 1/4 teaspoon kosher salt. Pulse for a few seconds until the flour and salt are fully incorporated. Scatter 1/2 cup cold unsalted butter cubes and 4 ounces cold cream cheese cubes and pulse the machine for 1 to 2 seconds at a time, 6 to 10 times. Pulse just until the dough forms large curds, but don't work it so long that it forms a ball on the blade. Scrape down the sides of the bowl with a rubber spatula, and pulse one more time to get rid of any excess flour/inconsistencies. Turn the cookie dough out on a clean, lightly floured surface and use your hands to gather it into a loose ball. Use a bench scraper or a sharp, serrated knife to divide the ball in half. Shape each half into a disk, before wrapping the disks in plastic wrap and refrigerating for at least 2 hours, or up to 1 day. When the dough has thoroughly chilled and you're ready to bake the cookies, centering 2 racks in the upper and lower third of the oven and preheat to 350 (F). Line two baking trays with parchment paper, or, preferably, a Silpat mat. Start with one disk of dough from the refrigerator. If it is too firm to roll easily, leave it on the counter for 5 to 10 minutes before you begin rolling. Lightly flour your surface and roll the dough into a 12-inch circle, before using an offset spatula to spread 1/4 cup Nutella and 1/4 cup Speculoos over the surface of the circle. Once the Nutella and Speculoos have been spread evenly, use a pizza slicer to cut the dough into 16 wedges, starting by cutting the dough into quarters, and then cutting each quarter into 4 triangles. Starting at the base of each triangle, roll the dough up so that the cookie becomes a little crescent shape. Arrange the crescents on one baking sheet, making sure the points are tucked underneath the cookies, and refrigerate the baking sheet containing the cookies while you roll out the second disk of dough. Repeat steps 2 and 3 for the second disk of dough, this time spreading the remaining 1/3 cup of Nutella over the dough circle as well as scattering 1/4 cup dried cherries evenly over the surface. In a small bowl, whisk together 1 large egg and 1 teaspoon cold water. Use a pastry brush to spread the eggwash glaze over each crescent, before sprinkling 2 tablespoons granulated sugar over the cookies. Bake the cookies for 20 to 25 minutes, rotating the cookie sheets from top to bottom at the midway point (I rotated mine at 12 minutes). Bake until they are puffed and golden, before turning out on to wire racks to cool. The cookies are best served warm, around 20 minutes or so from the oven. mmmmmm yeahhhh rugelach for all the wins!!! nutella and speculoos, ok that is genius!!!! I hate pie crust but I still adore rugelach... nostalgia at work! A cookie butter version sounds amazing. Hey! Yum. So I just made these, graham flour and all, and while they taste delish, my tops totally sank in the oven! Which never happens. Any thoughts? I did make the mix, stored in a jar and used the small batch quantity a few days later. I used coconut oil and lowfat milk. I will definitely be making the rest of the mix but would love them to look a bit prettier! Right? I'm kind of in the same boat as you (but am shy to admit it, since people always seem so scandalized when I say I'm not the world's biggest fan of pie). Glad I'm not alone! I would try using whole milk instead of low-fat, since it needs a solid protein structure to hold its shape. The egg and protein/fat from the whole milk should provide this. Let me know if you still run into any issues after this, and I can continue to help you troubleshoot! Ah thanks for noticing! Lots of folks were having trouble commenting, so I switched over to Disqus. It's so much better! I made these a few weeks ago and just made them for second time tonight! (They are in the oven as I type this!!) This is truly a wonderful recipe. I was a bit hesitant at first when I saw this recipe, but my mind kept wandering back to it, so I had to give in! These brownies are an absolute triumph—they are rich, velvety and taste unbelievably fresh! Thanks for the great recipe! OMG. Obsessed with this idea. I love anything Nutella and as a terrible Jewish baker, have actually never made rugelach myself but always left it for my mom to make. But this one, I think I am going to have to make when I get back home. I didn't know you were Jewish! Awesome. 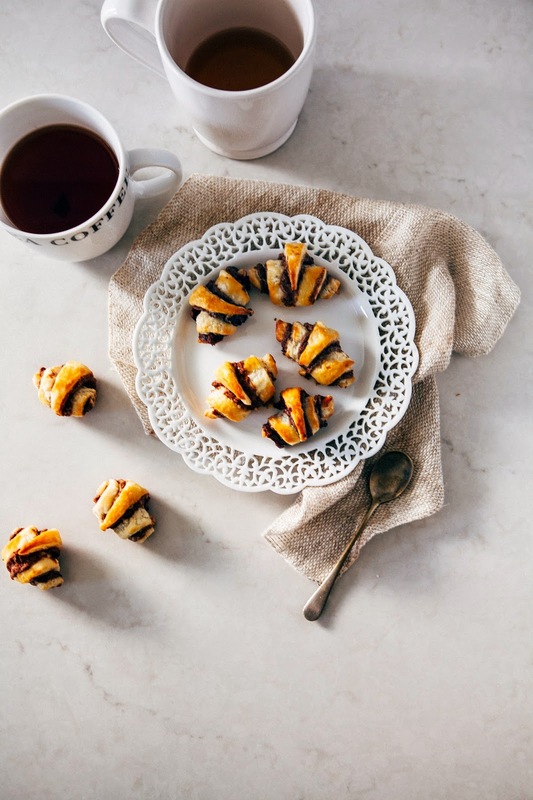 Also, seriously, this rugelach is fool-proof, all you need is a food processor. It's so easy, really. Another question for you here... I made these yesterday, let them cool and put them in the refrigerator, but somehow they're not quite 'set' enough for me to cut them. I mean, I can cut them ok, but they don't hold their shape when I go to get them out of the pan...I'm just stuck with a giant blob of chocolaty caramely goodness on my knife. Any idea what went wrong? This looks incredible. Totally want to try these for Christmas! Not sure why I did not see this before now, but just delighted that you made it! And love that your co-worker thought it was the best ever. Makes my day! Yes! That's totally a good way to go. Nutella in rugelach.. what a delicious idea!! Looks so SO yummy! is the dark chocolate baking chocolate or regular chocolate? could i use an 85% cocoa blend? thank yoU! You can use either, but I prefer dark chocolate paired with tea. 85%-cocoa blend would work! how much butter should we end up with after the infusion? do we have a total of 3/4 cups by the time we add the remaining 1/4 cup? I just made this pie for a friendly pie competition. I used a different brand of purée for a Mexican grocery store which worked well. It won best sweet, best crust and best filling out of a field of over 30 pies AND I saw people going back for seconds. Thank you! Great pie. Must agree that you are one of the coolest blogger. I was curious to see a stuff college essay college essay! Great article your writing style is very good .Plz keep it up thanks. Your recipe was DELICIOUS!! I really enjoyed the unexpected taste and burst of blueberries baked in chocolate! Your tips were really helpful, like not over mixing the batter! Thank you for sharing! I look forward to discovering more recipes through your blog! It most likely tastes good.The look of it could use some work. the random misinformation that's at the other blogs. Thanks for sharing this. The recipe and the description you have done here is good. It's great.